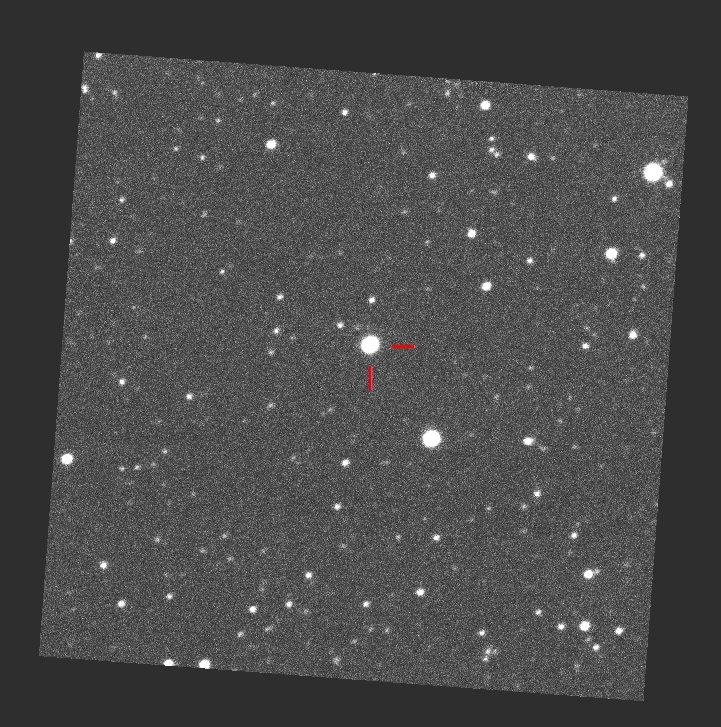 Following the posting on the Central Bureau's Transient Object Confirmation Page about a possible Nova in Oph (TOCP Designation: PNV J17260708-2551454) we performed some follow-up of this object remotely through the 0.10-m f/5 reflector + CCD from MPC code H06 (Mayhill station, NM) of iTelescope network. 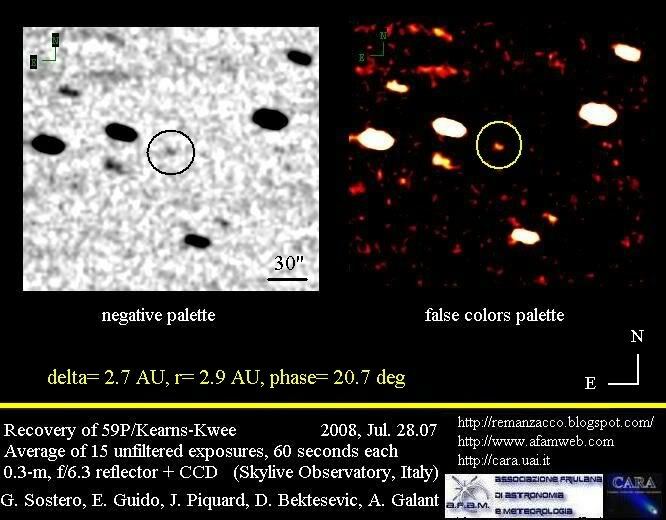 According to Cbet 3072 issued on March 28, observers at Koyama Astronomical Observatory (KAO) and at Okayama University of Science (OUS) have obtained a spectra of this variable star. 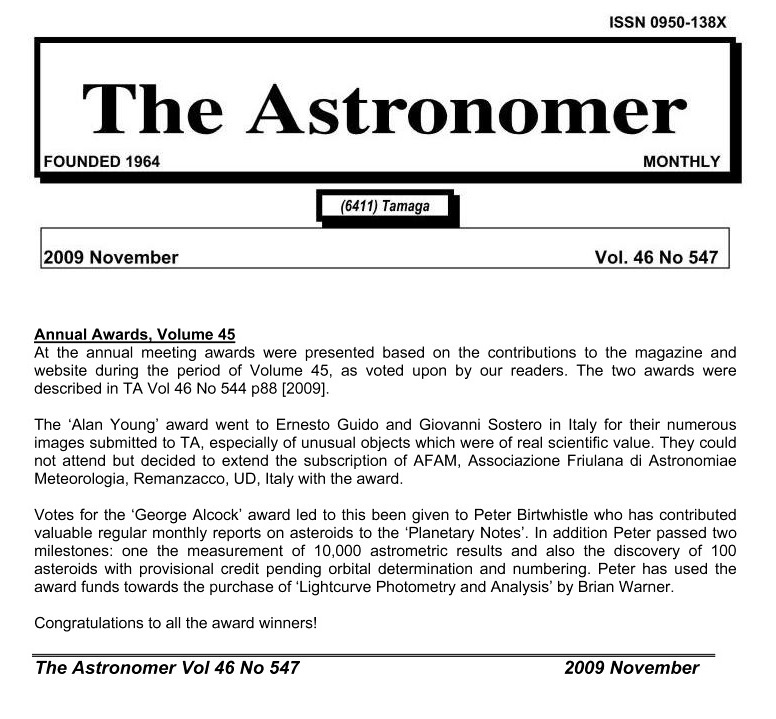 An H-alpha emission line can be seen in the spectrum. 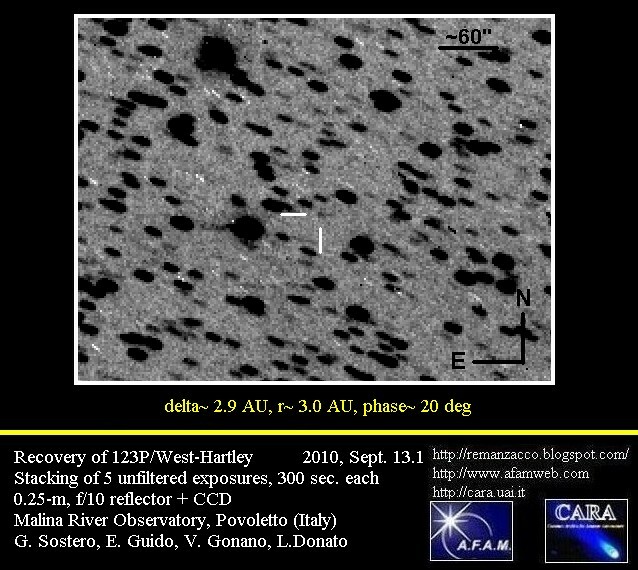 H_beta, Fe II, and O I 777.4-nm are also visible. 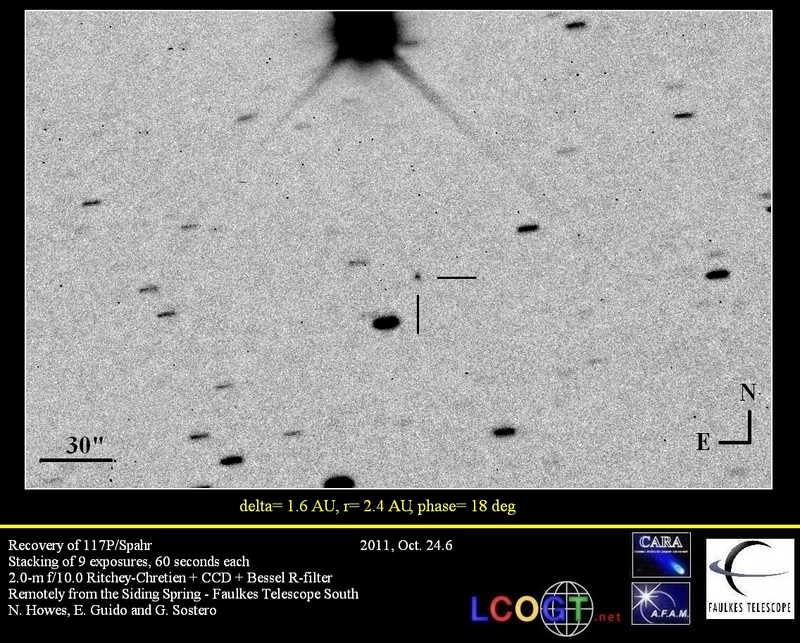 These features suggest that the object is an "Fe II-type" classical nova. 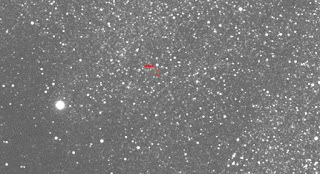 This nova, designated NOVA OPHIUCHI 2012, has been discovered by Hideo Nishimura (Miyawaki, Kakegawa, Shizuoka-ken) on three 13-s frames (limiting mag 13.5) taken on Mar. 25.789 UT with a Canon 200-mm f/3.2 lens and a Canon EOS 5D Digital Camera mounted on a Takahashi EM100 equatorial telescope at Gomyo, Kakegawa, Japan. 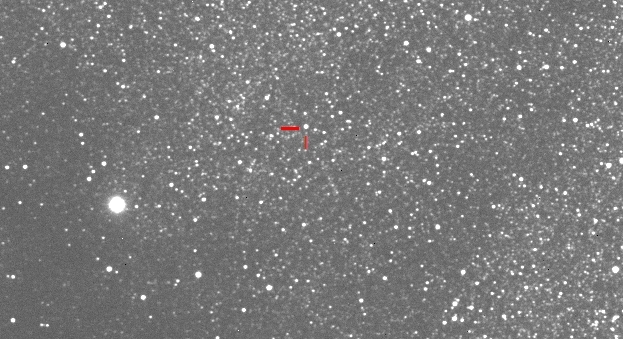 Following the posting on the Central Bureau's Transient Object Confirmation Page about a possible Nova in Cen (TOCP Designation: PNV J13410800-5815470) we performed some follow-up of this object remotely through the 2.0-m f/10.0 Ritchey-Chretien + CCD of "Faulkes Telescope South" (MPC Code - E10). According to Cbet 3073 issued on March 29, F. M. Walter, Stony Brook University, obtained a low-resolution (0.31-nm) red (560-690 nm) spectrogram of PNV J13410800-5815470 on Mar. 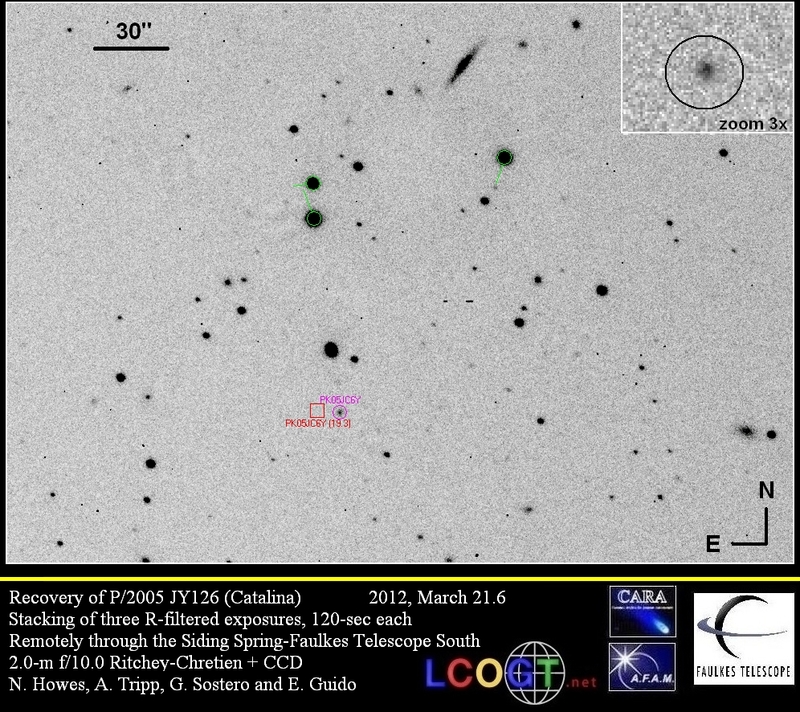 27.3 UT using the SMARTS 1.5-m telescope (+ RC spectrograph) at Cerro Tololo. 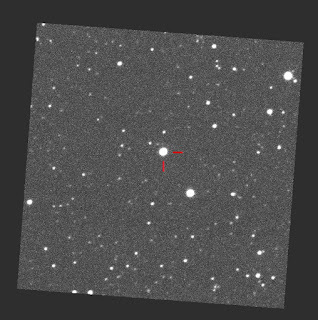 The variable is a classical "Fe II"-type nova. 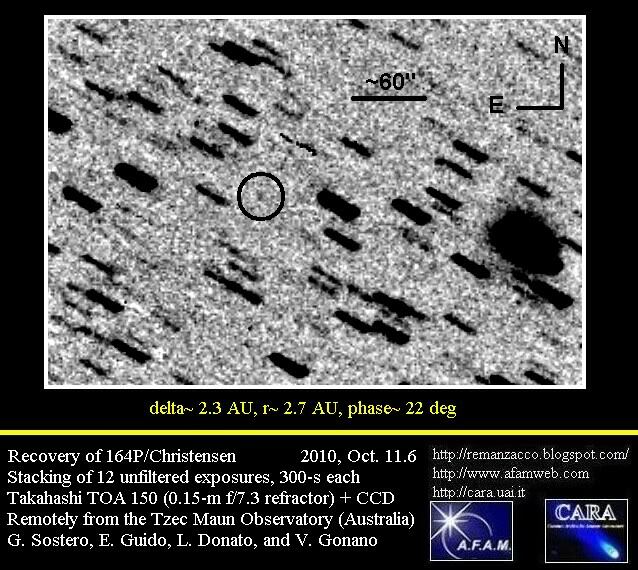 This nova, designated NOVA CENTAURI 2012, has been discovered by John Seach, Chatsworth Island, NSW, Australia, on six images (limiting mag 11.0) taken on Mar. 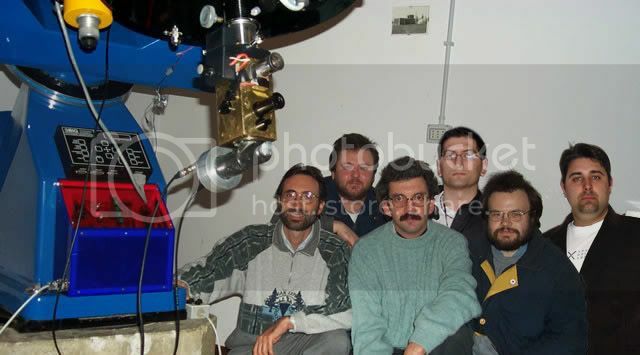 23.386 UT with a digital SLR camera (+ 50-mm f/1.0 lens). Cbet Circular No. 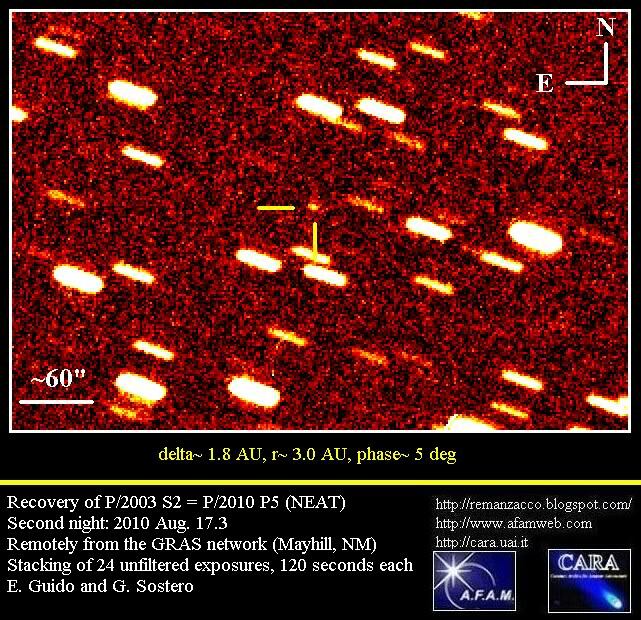 3065, issued on 2012, March 22, announces the recovery of comet P/2005 JY126 = P/2012 F4 (CATALINA) by our team; this comet was discovered on 2005, June 7.32 by Catalina Sky Survey and it was last observed on 2007, January 13. 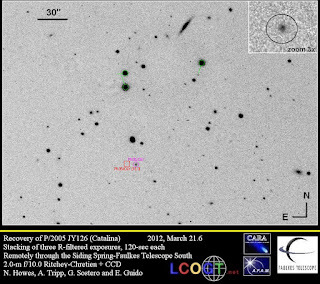 On 2012, March 21.6 we started an observing session to recover the periodic comet P/2005 JY126. 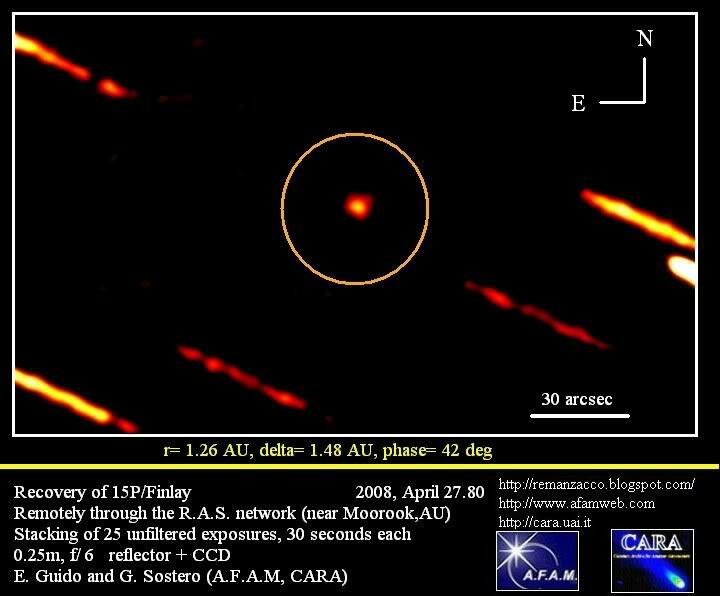 We found an object of magnitude ~19.6 located 8.5 arcsec west of the nominal position. 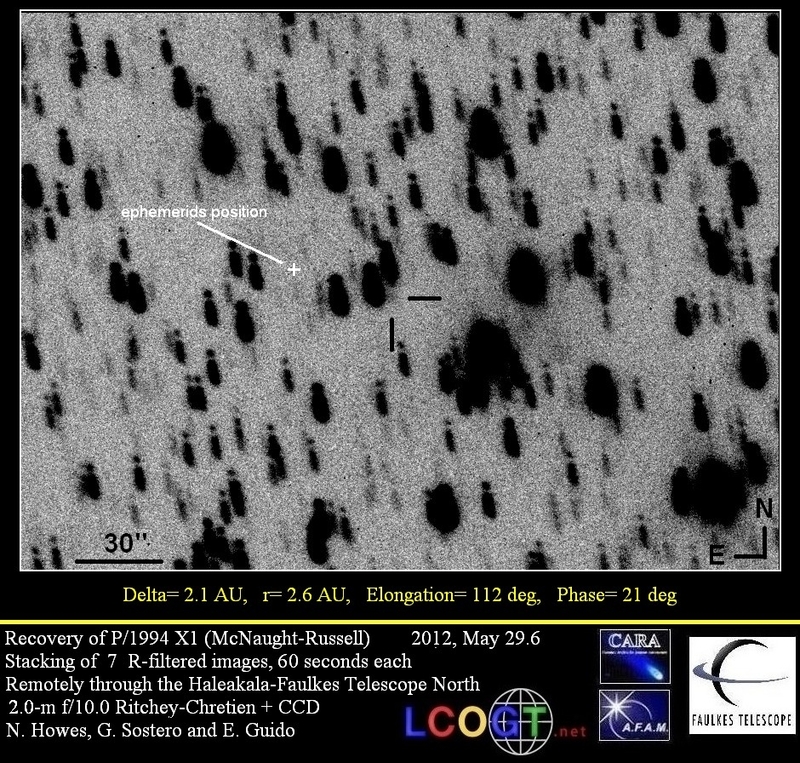 Stacking of three R-filtered exposures, 120-sec each, obtained remotely, from the Siding Spring Faulkes Telescope South through a 2.0-m f/10.0 Ritchey-Chretien + CCD, under good seeing conditions,shows that this object appears slightly "soft" compared to the nearby field stars of similar brightness. 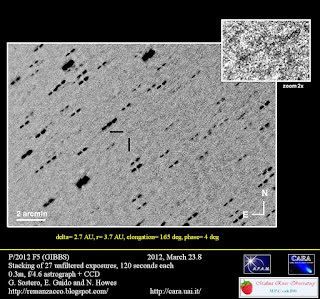 On 2012, March 22.4 we have been able to obtain a second night of observations by stacking of 29 R-filtered exposures, 120-sec each, obtained remotely, from the iTelescope network (near Mayhill, NM) through a 0.25-m f/3.4 reflector + CCD. Below you can find our recovery image of 2012, March 21.6. 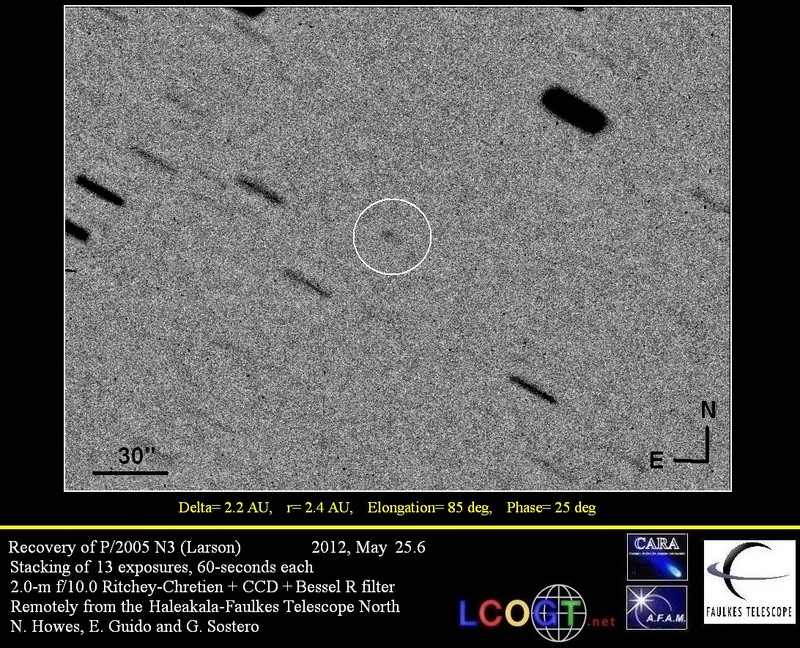 The red square shows the nominal position, while the circle shows where we actually found the comet.